Attractive and friendly pub just away from the main strip in Kentish Town, down one of those side streets where all the buildings are painted various bright colours. Inside it's been done up in a modern style, although the bar still has its share of locals. Leather seating occupies small alcoves around the bar. In the back room, an extensive conservatory has been added, with a beer garden area outside, mostly covered. On a Tuesday evening in October 2008, the conservatory was completely empty while Ewan ate his meal. No music was playing in the back room, though up front the atmosphere was somewhat more convivial. There are three ale handpulls, with Bass, Sharp's Doom Bar (£2.80/pint) and one other on an October 2008 visit. Beer is well-kept and staff are friendly. Thai food is on the menu. In October 2008, Ewan's vegetable green curry (£7.50) was nicely spicy and was served without much delay. As of mid-2010, food is served noon-3pm and 6pm-10pm Monday to Friday, and 1pm-10pm Saturday and Sunday. 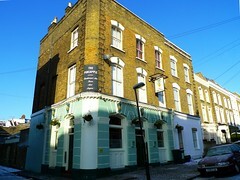 According to the July 2010 issue of the Full Pint newsletter, there's a quiz every Monday evening (from 8:30pm, according to a notice seen in October 2008) and live music every Tuesday evening. Last visited by Ewan and Kerry, July 2011. Opening hours taken from Time Out website, October 2008. Food times taken from advert in the July 2010 issue of the Full Pint newsletter. Last edited 2018-11-10 14:16:51 (version 20; diff). List all versions. Page last edited 2018-11-10 14:16:51 (version 20).